On hot, humid Orlando days, my first thought is to head to the water to cool off. On my family’s recent visit to Walt Disney World, we had the pleasure of not only staying at Coronado Springs Resort but I even had a chance one calm, cool morning to walk around the resort and check out its water features including four pools and a 22-acre lake that’s name translates to “golden lake”- and I quickly learned why as the sun reflected off its calm waters. Disney does resorts right, and I’m talking from the room decor (how many hidden Mickeys have you spotted in your resort room?) right down to the walking paths to and from the lobby. Walt Disney World loves giving families multiple water options at each resort, so it’s no secret that the resort water features at Disney world are whimsical and fun. 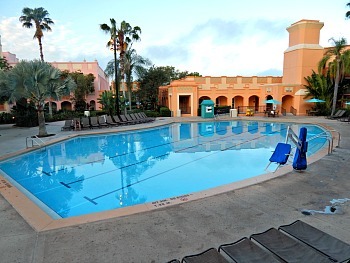 The Coronado Springs Resort water features and pools are no exception. The Walt Disney World resort revolves around water and the features that go along with it. Seriously. 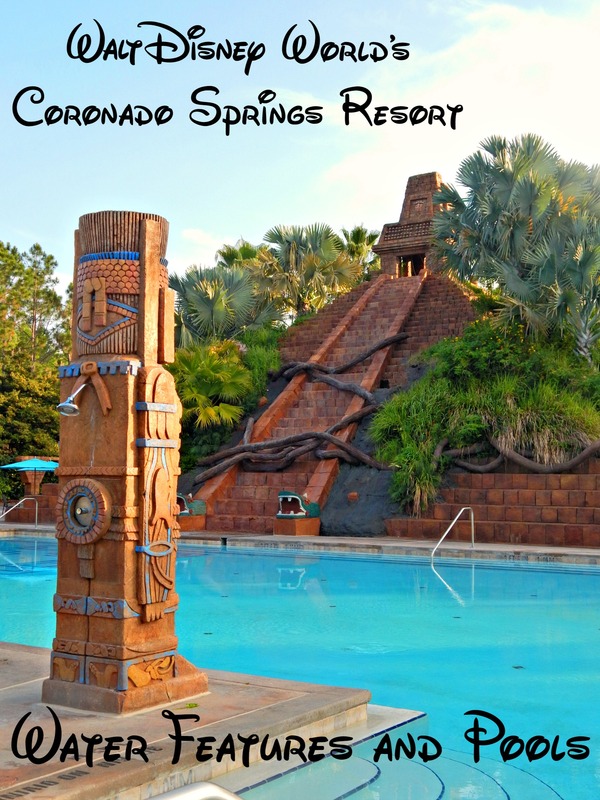 Coronado Springs Resort is built AROUND the beautiful 22-acre Lago Dorado so it really does revolve around water. As for the pools? Coronado Springs Resort has four! Yes, four. Each area of the resort has its own smaller pool, and by smaller I mean not as large as the main pool. All four pools are heated to a perfect 82 degrees Fahrenheit year-round, so if you do visit during an uncommon cold snap you can still take the kids to the pool and not see blue lips! 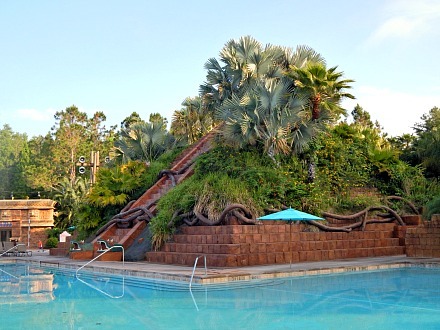 So, which pool at this Walt Disney World resort will suit your family? Here’s the scoop. The main pool area, called The Dig Site, is THE spot for water fun. The Lost City of Cibola Pool has not only a 123-foot long water slide but a 50- foot Mesoamerican pyramid with streaming water. The best part? Kids (and adults!) can climb up the pyramid to a safe level and play in the water. The Dig Site is also home to a kiddie pool and two 12-person spa pools. Adults will revel in the largest hot tub on all of Walt Disney World resort properties. With room for 22 adults you won’t have to wait your turn for a relaxing seat. And while you over 21 years of age adults are at it and feel like enjoying a cold beer or cocktail, Siesta’s Pool Bar is only a few steps away from the main pool and the hot tub. When the kids need a break from swimming at The Dig Site, you can still hang around the area as there’s so much to do like seasonal pool activities, a sandy volleyball court, and the Iguana Arcade. Tiny tots will dig the shallow kiddie pool beside the main pool as well. 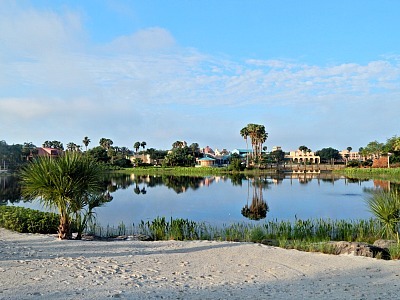 Coronado Springs Resort is broken into three sections: Casitas, Ranchos, and Cabanas. 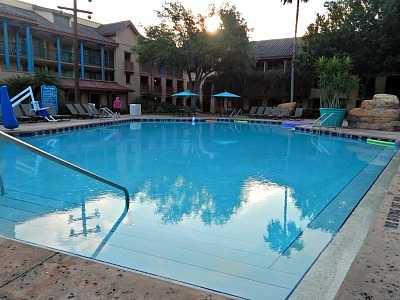 Each of these sections at the Walt Disney World resort is host to its own leisure pool. Although these pools are a toned-down version of the Lost city of Cibola pool, there’s still plenty of lounge chairs and room for families with children of all ages. Here’s my favorite addition to each of the three smaller pools: Families with handicapped children or children with special needs can still enjoy these pools as there’s a lift seat that lowers into the pool. Lockers, showers, and restrooms can be found near each of the four Coronado Springs Resort pools as well as life vests in varying sizes from infant to adult. If your next thought was about towels (I always like to know in advance, too! ), all moderate resorts (including Coronado Springs Resort) have towel carts by the pools which will not only save you from using your room towels but will save you from having to call “mousekeeping” to have extra ones delivered. If the kids want to stay in the pool well after dinner, Coronado Springs resort has Movies Under the Stars- a nightly viewing of a popular Disney movie at The Dig Site. Families can relax in lounge chairs or stay in the water and watch the outdoor screen that’s set up especially for the movie fun. Guests are not permitted to swim in Lago Dorado, but that doesn’t mean you still can’t enjoy the water! La Marina offers daily watercraft rentals allowing resort guests to take a calming water ride on a boat, kayak, paddle boat, or water cycle. Hours for renting watercraft varies so please check with the Coronado Springs Resort front desk before you trek to the lake. So glad to read this! We’re going to Disney next month for Halloween and booked a room at the Coronado. We’ve stayed at the Art of Animation (loved it!) resort and the Port Orleans – French Quarter (hated it!) resort, so was hoping this resort would be better than the experience we had last year at FQ. Glad to hear a nice review on it. Thanks.